Quality Filmmaking, Red Carpet Events and VIP Treatment – All on the Central Coast! The SLO Film Fest, formerly known as San Luis Obispo International Film Festival, believes in the sophistication of Golden Age cinema without the Hollywood hype. Moviemaker.com listed the 2017 SLO Film Fest among the “50 Film Festivals Worth the Entry Fee in 2017” for its genre variety, unique experiences like wine and movie pairings, and mission to prove that movies matter. After last year’s record-breaking attendance, the 25th anniversary of the SLO Film Fest is on pace for its best year yet. This annual 6-day event offers independent filmmaking and youth filmmaker programs in addition to screenings at a variety of unique locations along the Central Coast. 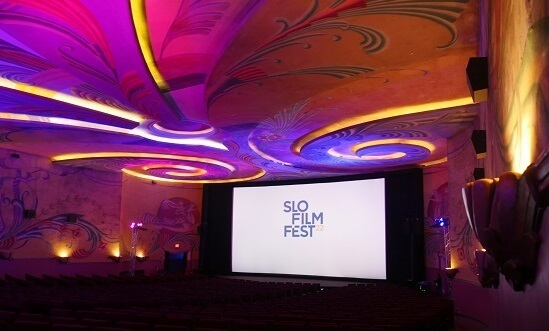 With over 100 Short Films, Documentaries, Narratives, and Features in all, the SLO Film Fest is a cinematic smorgasbord. The SLO Film Fest will be centralized around Downtown San Luis Obispo, with the Festival Headquarters and Lounge located at 1040 Court Street. Additionally, the festival will feature classic venues like the Fremont Theater, Palm Theater, and Downtown Cinemas. New to the festival is SLO Brew Rock, a state-of-the-art movie and concert venue with a great assortment of food, drinks, and seating. Starting Wednesday, March 13th, each evening of the festival will conclude with an afterparty at the Festival Lounge, except on Saturday, when the King Vidor After Party will be held at the SLO Museum of Art. Movie Mogul Pass holders will enjoy full access to the Festival VIP Lounge, featuring daily complimentary wine, beer, non-alcoholic drinks, food, and entertainment. The 2019 SLO Film Fest will kick off Tuesday, March 12th with an Opening Night Party at Luna Red and An Evening with Katharine Ross at the Fremont Theater, as she performs the story of “Kate Shelley and the Midnight Express” alongside the Malibu Coast Silent Film Orchestra, followed by a screening of “Butch Cassidy and the Sundance Kid.” Wednesday, March 13th will be highlighting Films of the Central Coast, presenting over a dozen films throughout the Downtown SLO area. Thursday’s screenings begin at 10 a.m. with “General Magic” at the Palm Theater and continue until the After Party at the Festival Lounge at 9 p.m. Friday, March 15th will feature a Filmmaker Mixer in Festival Lounge at 5 p.m., followed by Surf Nite in SLO at the Fremont Theater. Saturday’s festivities will include Behind-the-Scenes Panels in the Festival Lounge, among tons of other films, presentations, and shorts. Finally, the Festival will conclude Sunday, March 17th with Closing Night Awards and a screening of “After Everything” at 6 p.m., followed by the Closing Night Party at the Festival Lounge at 8 p.m.
Plan your visit to SLO for the Film Fest and enjoy endless things to do along the Central Coast. Attend Thursday Night Farmers’ Market in Downtown SLO for delicious eats and a lively atmosphere. Spend a little time between movies perusing the shops and art galleries around town. Take in the beautiful surroundings on one of SLO’s many hiking trails. Experience San Luis Obispo’s up-and-coming craft beer scene or travel along a wine trail. Grab a bite to eat at a local restaurant, featuring farm-to-table plates and innovative drink concoctions. The SLO Film Fest is an event you won’t want to miss. Purchase your tickets today!